Congratulations to David Stone, owner and founder of Solid Stone Fabrics on being selected as a finalist in the Momentum Business category of the Association for Enterprise Opportunity’s (AEO) Power of One Awards. Stone founded Solid Stone Fabrics in 2003 and operates in his hometown of Martinsville, VA, a Virginia Main Street community who has seen industries come and go. Its chief industry for many early years was the manufacture of plug chewing tobacco. Following the American Civil War, the plantation economy collapsed, leading the way for the creation of the tobacco monopolies by R.J. Reynolds and James Buchanan Duke in the early 20th century. After this period, the city’s main industry was furniture construction. Shortly after the second World War, DuPont built a chemical manufacturing plant, giving way to a thriving chemical industry, which led to Martinsville asserting itself as an independent city in 1928. In the early years of the Cold War, DuPont built a manufacturing plant for producing nylon, a vital war material, sparking the growth of the textiles industry in the area. Martinsville became known as the “Sweatshirt Capital of the World.” The 1990s brought about major changes in global economics and trade that made textile manufacturing financially unfeasible in Martinsville, leading to the closure of many firms and thousands of laid-off workers. This brief look back at the industrial history of Martinsville serves to highlight the importance of Solid Stone Fabrics’ success. 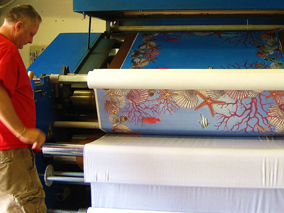 Stone found a niche market in stretch materials and produces banners for Schools and universities across the nation and costumes for Sea World and Disney performers, as well as other textile products for a wide range of clients including The Virginia Museum of Natural History. Please join us in celebrating this recognition and wishing him continued success.